Huawei’s press event will kick off any moment now but right before it, we have already seen numerous snaps showing that the company will indeed launch the Huawei Ascend P2. After it shocked many with a 6.1-inch smartphone in the form of the Ascend Mate at CES, now Huawei is finally bringing a device with more appeal to the masses. 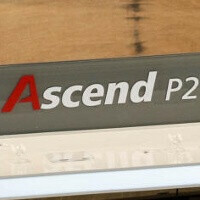 The upcoming Ascend P2 will have a 4.7-inch display but it won’t be 1080p. Instead the P2 will feature a 720p screen and compensate with having an extremely slim, 6.5mm body. At the same time, it will feature a whopping 3,000mAh battery. We don’t know how Huawei managed to solve the puzzle of thickness and huge battery, but if this proves true that would be a very enticing proposition. Other suggested specs are a quad-core processor, 2GB of RAM and a 13-megapixel rear camera. It is also likely that the P2 is water and dust resistant. To sum it all up, having a huge battery in a sleek body is of such a huge benefit we wouldn't take the lack of a 1080p display as a real con. What about you? If all this is true, I really wouldn't mind. Providing the silicon is up to scratch, of course. Having such a massive battery and IP57 capability is a mighty attractive proposition, indeed. Sadly that part didn't quite prove true. 720p is just fine, not like you can distinguish the difference at that size anyway with the human eye. 3,000 Mah battery, we'll take their word for it but i'm glad they put the emphasis of battery before anything else, thinness aside. Is this also running 4.2 as I read somewhere else they had implemented it in. Nice device. FHD at 4,5" is a massive overkil affecting both performance and battery life, and while you notice the difference between the Note II's 260ppi and a fullHD screen, you wouldn't notice the step-up from the P2's already stellar 350ppi. Combined with extreme slim design and a huge batter, this phone is a winner. Well done Huawei! Let the new kids on the block steal some shine! I don't really care about the resolution,well HD 720p is enough for me,because I'm not used to make my phone charge everytime I can.For me what's important is brightness,because I use my phones very much in bright sunlight(outdoors) and the brightness is very important for me.Talking about screen resolution,I mean I've never really noticed any difference between HD or non HD screen,even though there is a little bit difference for sure,but with an eye(without any technology) the difference isn't big.